Are ocean currents hastening the retreat of Greenland's glaciers? Time was, saying something moved “at a glacier’s pace” meant it was grindingly slow. No longer. Glaciers don’t move like that anymore. Since the early 1990s, glaciers in Greenland have been shrinking at an unprecedented and ever-faster pace. The well-studied mountain glaciers of Europe typically move about 50 meters a year; some of the glaciers in southeast Greenland are now moving at a rate of 38 meters a day. 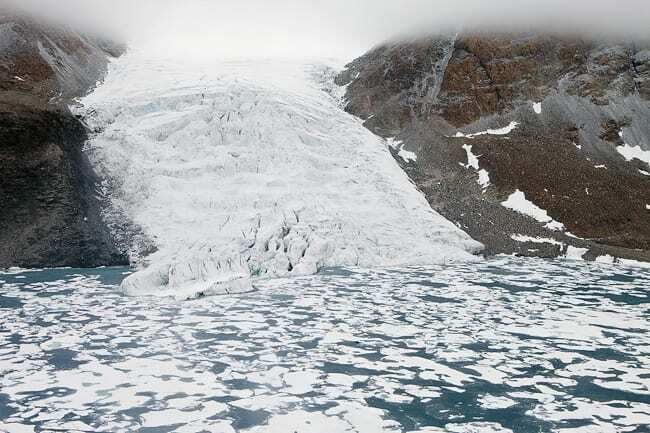 Greenland’s glaciers are not simply melting, cautions Fiamma Straneo, a physical oceanographer at Woods Hole Oceanographic Institution (WHOI). It would be more accurate to say they’re falling apart. More and more, the drip-drip-drip of rapid thawing has been accompanied by the thunderous crash of massive ice chunks cracking off the glaciers’ front edges and plunging into the ocean. “This is a very important distinction,” said Straneo. “It’s not as simple as ‘We’ve increased the air temperature above Greenland, and it’s driving more melting.’ The glaciers are moving a lot faster, they’re thinning, they’re breaking up, and they’re retreating. They’re dumping more ice into the ocean. Glaciers are in perpetual motion. The enormous weight of ice piled on Greenland flows downhill, channeling like rivers into individual glaciers. Near the coast, the glaciers disgorge into outlet fjords, where they lose ice to the water. Every winter, snowfall on the ice sheet replenishes the supply of ice. When the processes of loss and addition are approximately in balance, the glacier front stays in about the same place. If the glaciers lose ice faster at the bottom than snow accumulates at the top, the glacier recedes. While some of the recent loss of glacier ice is due to warming of the air above the glaciers, a few years ago Straneo and other scientists began to wonder whether the ocean could be playing a role, too, by affecting the front ends of the glaciers where they reach into the ocean. Greenland’s large glaciers flow into fjords that, like fjords everywhere, are long—about 100 kilometers (62 miles); skinny—about 8 kilometers (5 miles); and very deep—about 900 meters (half a mile) at their deepest points. The front, or leading edge, of each glacier rises about 100 meters above the waterline and reaches below it all the way to the bottom. That exposes the glacier to a lot of water in the fjord. In past decades, most of the glaciers also had an “ice tongue,” a floating shelf of ice about 100 meters thick that extends from the main body of the glacier. The tongues stick out many miles into the fjords, with a few hundred meters of water flowing beneath them. In recent years, many glaciers have lost their tongues; now they end in blunt cliffs of ice that reach more or less straight down to the ocean bottom. Straneo and her colleagues thought the loss of the ice tongues and the acceleration of the glaciers might be caused in part by changes in the water in the fjords. If the water beneath the tongues had gotten warmer, that could have increased melting, weakened the tongues, and perhaps sped up the glaciers’ loss of ice into the fjord. A role for the oceans? Oftentimes, scientists gain insights into complex natural processes by consulting computer models designed to simulate the processes. On the question of glacier loss, however, none of the existing models took into account what happens at the interface where glacial ice meets ocean water. Ruth Curry, a physical oceanographer at WHOI, studies how masses of water move through the oceans and link far-distant regions. To her, it seemed reasonable to think that warming oceans could be affecting the great glaciers. Previous studies had shown that ocean currents flowing past Greenland warmed significantly at about the same time the glaciers started accelerating; but nobody knew whether that warmer water was getting into the fjords. There was reason to think it might not. Many fjords in northern Europe have a sill, or underwater ridge, across their mouths, which restricts the flow of water into and out of them. But few fjords in eastern Greenland had been studied in detail. Nobody knew their structure or how the water moved within them. Until the glaciers started falling apart, there was little reason to go there and ample reason not to. Remote and forbidding, even in summer they teem with icebergs and slabs of pack ice. “Why would anybody want to go there?” said Straneo. “They’re hard to get to, nothing was happening, the glaciers weren’t moving, and the icebergs pose a huge challenge” both to navigation and to instruments left in the water for long-term measurements. But with Greenland’s glaciers changing so fast, the time had come to find out more about the interaction between ice and ocean. Straneo had already worked on the waters west of Greenland. Then a few years ago she and Gordon Hamilton, a glaciologist at the University of Maine, started talking about what it would take to study the waters in and around the glacial fjords on the eastern side of Greenland. They scraped together enough money to charter a do-it-themselves research vessel—the 24-foot-long boat of Arqaluk Jørgensen, a telephone technician and part-time fisherman from Tasiilaq, the nearest village to Sermilik Fjord. Dwarfed by the fjord’s enormous icebergs, the boat didn’t even have room to house the researchers overnight; except for two nights late in the season when they stayed at a tiny settlement partway up the fjord, they returned to Tasiilaq every evening and made the two-hour trip back into the fjord every morning. As it turned out, Jørgensen’s little boat had advantages over larger, “official” research vessels. It was inexpensive; it could maneuver in small spaces; and the scientists got the benefit of the pilot’s lifetime of experience navigating, fishing, and hunting in those waters. Straneo recalled that Jørgensen would stand on the captain’s chair to get a better view of where they were headed and steer with one stockinged foot on the wheel. Guiding the boat carefully through dense fog, he could sense approaching icebergs and boats minutes before Straneo and her colleagues were aware of them. Straneo’s view of the interaction between science and local cultures changed during that first voyage to Sermilik. “For me the real first experience in Greenland was on Arqaluk’s little boat,” she said. “We got such a good feel for what it was like to work in these regions. He just knew them. And that’s invaluable. Although Jørgensen’s boat was too small to be used to deploy large moorings, it was big enough to handle the equipment needed to make some basic measurements of water conditions. In July and again in September, Straneo’s team measured temperature and salinity at various depths, at four distances along the fjord and also across the channel leading into its mouth. What they found stunned them. At every sampling station in the fjord, from 150 to 200 meters down to the bottom, the water was warm. Three and a half degrees Celsius, or just over 38°F, isn’t warm in the bathtub sense, but it’s plenty warm enough to melt glacier ice, and it’s much warmer than anyone expected to find in a fjord in Greenland. The temperature of Arctic seawater often drops below the freezing point of fresh water (0°C or 32°F), because the salt in it allows it to cool past that point. Water coming off the melting glaciers is just a shade above freezing. For water in the fjord—anywhere in the fjord—to be several degrees above freezing was startling. Earlier work by researchers at WHOI and elsewhere showed that warm water from the subtropics makes it to the east coast of Greenland via a series of powerful currents. The Gulf Stream carries it northward along the coast of North America, then veers toward Europe as the North Atlantic Current. West of Ireland, the current splits into two main branches. One loops back, skirts the southern shore of Iceland and then sweeps southward along the southeast coast of Greenland as the Irminger Current. The other becomes the Norwegian Atlantic Current and heads north past Norway; then it turns west, converges with polar waters, and heads back southward along the edge of the continental shelf off Greenland, where the seafloor drops off into the depths of the Greenland Sea. 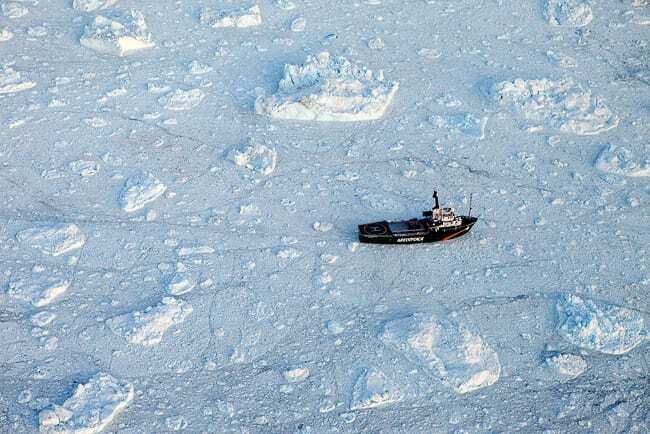 In 2008, a few months before Straneo explored Sermilik Fjord from Jørgensen’s little boat, Curry had tested the waters along Greenland’s east coast as part of a research cruise on a Norwegian coast guard icebreaker. At the latitude of Sermilik Fjord, she found the waters of the Irminger Current were very warm—up to 6°C (nearly 43°F). 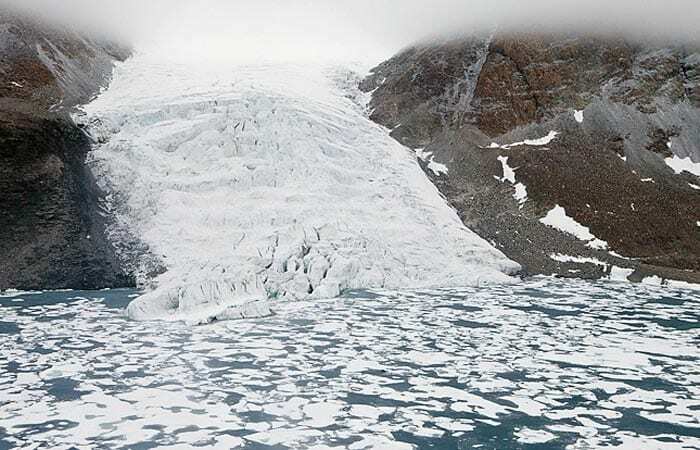 Even waters off the northeastern tip of Greenland, which had traveled farther from their subtropical origins and been cooled by contact with Arctic winds and waters, was warm (about 2°C or 35.6°F). So the team knew that warm water flows just offshore along Greenland’s east coast; and they discovered that warm water was reaching far up into Sermilik Fjord. But how does it get into the fjord? Does it stay long enough to affect the glacier? Is Sermilik unusual, or has the same thing happened in other fjords in eastern Greenland? The answers to those and other questions awaited another research cruise. Buddy, can you spare a boat? 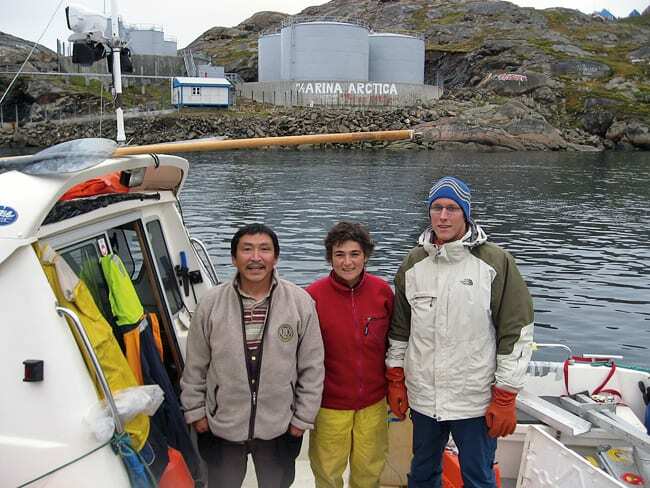 Excited by their findings, Straneo, Sutherland, and Hamilton wrote a proposal to the National Science Foundation (NSF) seeking money to go back to Sermilik Fjord. They succeeded, but the funding wouldn’t be available until 2010. So they kept searching for a way to get to Sermilik in 2009. They wanted to retrieve two small moorings they had left to take measurements over the winter. They also wanted to do a more thorough survey of temperatures and currents and try to find out how the subtropical water was getting into the fjord. Luck turned their way when Hamilton got a call from a private organization that was interested in raising awareness about change in the Arctic and was inviting several scientists to conduct research aboard its icebreaker. Free use of an icebreaking ship? Of course they were interested. There was just one catch: The call had come from the environmentalist group Greenpeace, and the ship was its vessel, Arctic Sunrise. “I was initially reluctant about using Greenpeace, because they carry a lot of political baggage,” said Curry, whom Straneo had invited to join the team. Sutherland also had reservations. Straneo was less concerned. 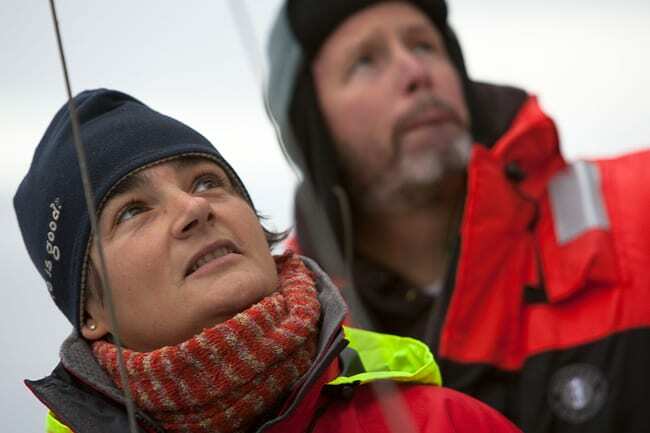 “I’m from Europe, and Greenpeace in Europe is very active and very well regarded. They’re sort of seen as heroes,” she said. Furthermore, Hamilton had worked from a Greenpeace ship a few years earlier and had no problems. Greenpeace guaranteed that the scientists would not be interfered with or pressured in any way. In turn, the scientists agreed to make themselves available for interviews and photographs by about a dozen journalists who were also invited to join the cruise. Straneo didn’t mind the interviews, but the presence of the journalists on board produced the only real downside of the trip: With so many berths allotted to the press, there weren’t enough for her to bring along a full scientific and technical team. Even Curry was won over. Besides, she and her colleagues couldn’t have done the work any other way. Being aboard the Greenpeace icebreaker opened up new possibilities for study. Besides revisiting Sermilik Fjord, Straneo and her team also examined the waters in two fjords farther to the north. Kangerdlugssuaq Fjord lies 250 miles up the coast from Sermilik at 69°N latitude. Like Sermilik, it drains a large glacier that has been accelerating at an unprecedented rate, but the ocean water at its mouth is slightly cooler than that near Sermilik. The third fjord they visited helped them get critical data in their effort to understand how changes in the ocean might be influencing the glaciers. There had been no way to find out what Sermilik and other fjords were like before the recent warming trend set in. How could the researchers know that whatever they found now was substantially different from the conditions that prevailed 20 or 50 or 100 years ago? 79N drains a massive glacier that still has a huge ice tongue. Small rocky islands near the mouth of the fjord hem in the ice tongue and may impede the flow and rapid loss of glacier ice into the fjord. 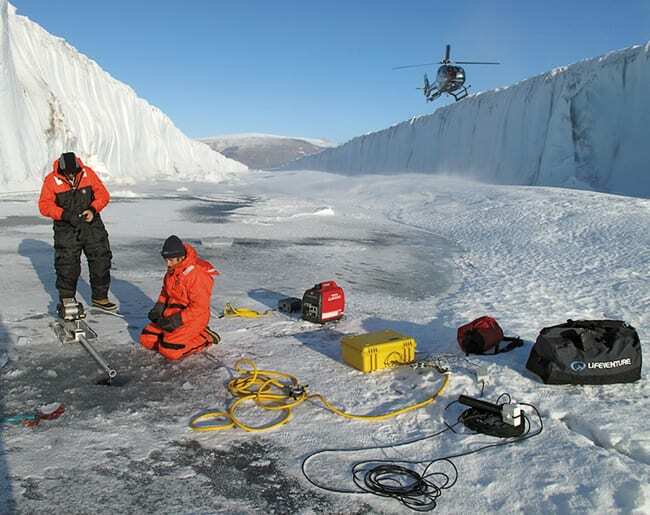 If the researchers could find a way to measure the temperature of waters underneath the ice tongue, 79N offered a fine natural laboratory for observing the effects of warming seawater on a glacier/fjord system that was not accelerating. Pack ice in the fjords was so thick that even the Arctic Sunrise couldn’t penetrate to the glacier fronts. Fortunately, the ship had another way to give the researchers access to the inner reaches of the fjords—a helicopter and a pilot with experience in the Arctic. “Lucky Bird,” as the researchers called it, ferried them to within a few kilometers of the glaciers, enabling them to take measurements in areas that they could not have sampled otherwise. 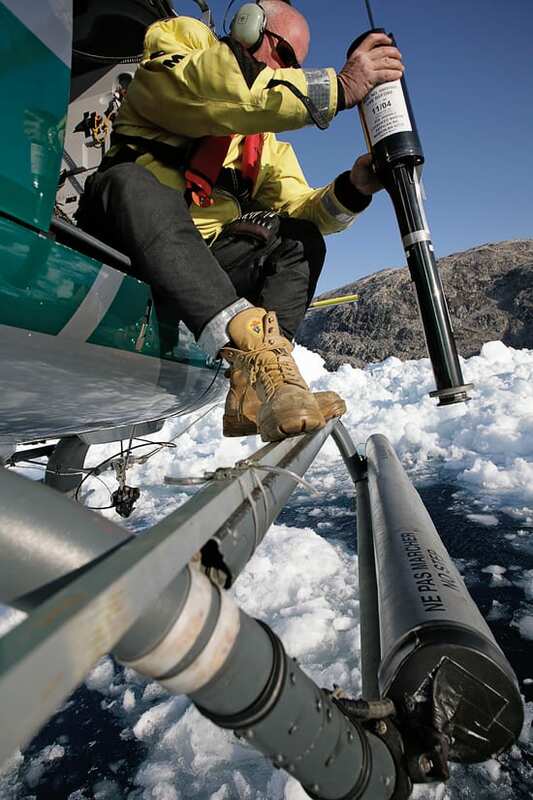 As they flew over an ice-packed fjord, the team kept a lookout for leads of open water or spots where the ice looked thin enough to let an instrument drop through. When they spotted one, they had the pilot hover a few feet above the surface while one member of the team dropped an expendable bathythermograph, or XBT, out of one side of the helicopter, and another dropped a grounding wire out of the other side. An XBT measures water temperature as it sinks, transmitting the data up the wire to the researchers. As its name implies, it’s not retrieved and reused; each XBT completes one run and then is left wherever it lands. Working from the helicopter “was the most fun part” of the whole cruise, said Sutherland. “It was crazy.” The pilot had to keep the chopper steady for the several minutes it took an XBT to complete its run to the bottom, and the scientists had to aim the XBT while sitting, well-strapped-in, with their legs hanging out of the craft. Lucky Bird’s doors had been removed to give the team a clear shot at the seams of open water below. During the monthlong cruise, Straneo and her team deployed 11 moorings and three floats that will gather data near the glaciers for a year. They also measured temperature and salinity, from the ocean surface to the bottom of the fjord, at various distances into each of the three fjords. They were even able to take measurements beneath the ice tongue at 79N. Several miles up one arm of the fjord, the tongue had begun to split, in much the same way that a rift opens in a continental plate. At one end, the crack was just a few feet wide but a hundred or so feet deep; at the other, it was as wide as a football field and just a few yards deep. Along its whole length, the crack remained floored with ice. Near its wide end, the ice floor was thick enough to support a helicopter and four people, yet thin enough to drill through with an auger. Straneo and her team did just that, riding the Lucky Bird into the crack, punching holes in the ice, and dropping XBTs and other instruments into the water below. The researchers found that warm ocean water, originating from subtropical currents, had moved from the continental shelf into all three fjords. Even in 79N, far above the Arctic Circle and under a sheath of ice, at every location they checked below 150 meters, the water was above 32°F. It wasn’t as warm as water in the more southern fjords, but it was warmer than expected, and definitely warm enough to melt ice. The researchers identified three distinct masses of water in the fjords. At the surface was a thin layer of cold, fresh water that had melted off the glaciers. Just below the meltwater was a 100- to 150-meter-thick layer of cold, slightly saltier and denser Arctic water. Below that, from about 150 to 200 meters deep all the way to the bottom, the water was much warmer, saltier, and denser. The differences in the salinity and density of the three waters keep them separate. “It’s like putting oil and water together,” Curry said. “They don’t mix.” It doesn’t take fancy instruments to know they’re separate, she said; dip a finger in a sample of each one, and you can taste the difference. The scientists weren’t able to take measurements right next to the glacier fronts, but the warm water mass showed no dissipation from the fjord’s mouth to within a few kilometers of the front. 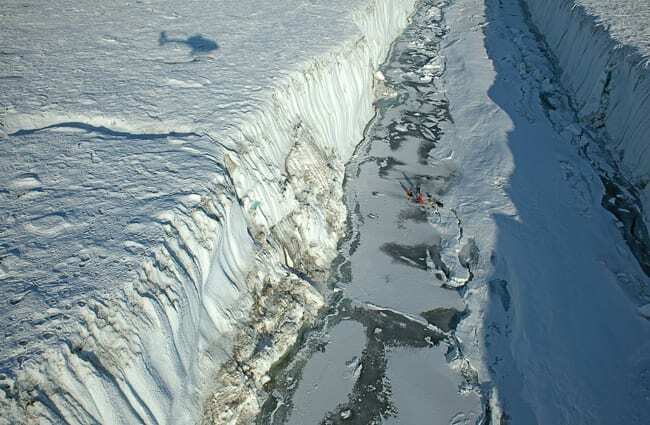 It’s highly unlikely that it disappeared in those last few kilometers, she said; it probably persisted all the way up to the submerged face of the glacier. How does so much warm water get into the fjords? To find out, the researchers measured the speed and direction of the currents within and just outside the fjords. They got data about winds and major storm events from weather stations and satellites and took a close look at the structure of the fjords themselves. That last item proved to be critical. None of the three fjords has a large sill that restricts waters flowing in from or out to the open ocean. They are deep all the way to their mouths and even beyond—a trough or a series of deep pools extends from each fjord’s mouth out onto the continental shelf. Straneo said that indicates that in past ice ages, the glaciers advanced and gouged troughs all the way to the edge of the shelf; when they retreated, the troughs and fjords remained. Today the troughs provide channels that allow deep, warmer ocean waters to move up into the fjords. The researchers found unexpectedly strong currents in the fjords, along with strong winds and storms along the coast just outside the fjords. “Eventually we figured out that whenever you have a storm coming up the coast of Greenland, it generates strong winds along the coast, and these winds drive a very active exchange between the fjord and the shelf,” said Straneo. The winds, which usually come out of the northeast, push surface waters into the fjord, creating a short-term exchange in which ocean water flows in on top and deeper fjord water flows out. After the storm, when the wind subsides, the flow reverses: Surface water flows out, and deeper water—which is quite warm—flows in. Once they get into a fjord, Curry said, the deeper waters tend to stay warm. A fjord’s narrow shape leaves little room for deeper and upper water masses to swirl and mix. Polar water stays nearer the surface; subtropical water stays deep in the fjord—and stays warm. The researchers don’t think this pattern has changed in recent years. More questions remain to be solved. Is the recent acceleration of the glaciers related to the warm water in the fjords? Perhaps the loss of a glacier’s ice tongue “undams” the river of ice, allowing it to flow faster. And why is there more heat in the water along the coast now than there was in times past? Some scientists have suggested that it’s simply part of a natural ocean-atmosphere cycle called the North Atlantic Oscillation, but Curry said the ocean water flowing north now is carrying more heat than in the past—and she attributes at least some of that difference to climate change. “The heat content of the subtropical source water is higher than at any time in the last 60 years, and that can’t be explained unless you take into account greenhouse warming,” she said. Clearly, there is a lot yet to learn about how the oceans affect Greenland’s glaciers. But by venturing into one of the most challenging environments on Earth, Straneo and her colleagues have shown how important the ice-ocean boundary is to our understanding of glacier loss. And it’s a good thing the team got the measurements they did, when they did, said Curry; glacial time machines are in serious decline. A study published recently in the journal Nature reported signs that glaciers throughout Greenland are beginning to accelerate —all the way up to and beyond 79N. Straneo is planning a follow-up cruise to learn more about what is happening at the ice-ocean boundary. 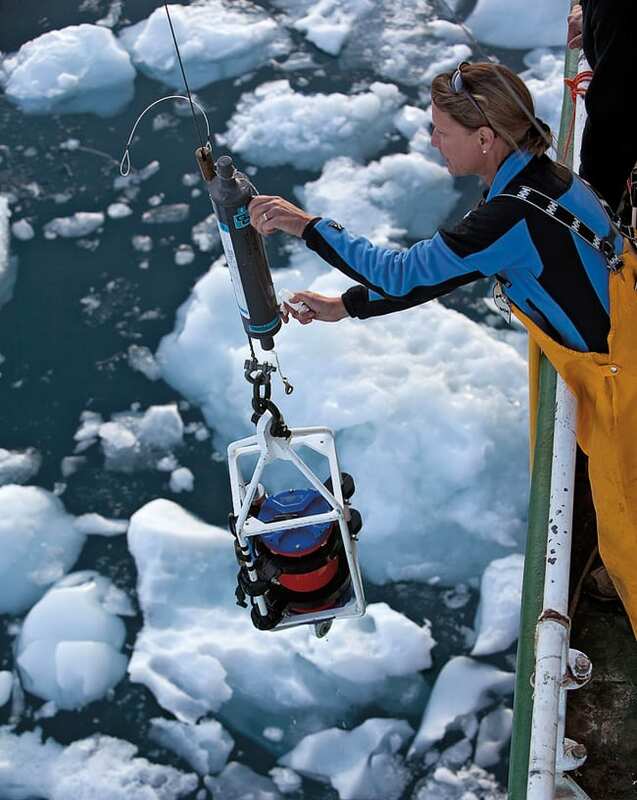 If she can retrieve the moorings she deployed in 2009, they will provide the first year-round data from the fjords and tell her whether the deep warm water stays all year, and how circulation within the fjords changes with the seasons. Getting such data will be hard; one of the two moorings she left in Sermilik Fjord in 2008 disappeared, and the other had moved dozens of meters away from the spot where it had been placed, probably the victim of a hit-and-run iceberg. But the displaced mooring survived and recorded valuable information about the persistence of warm water in the fjord—showing that it is possible to get long-term measurements in this challenging environment. A grant from the WHOI Arctic Research Initiative, which paid for her trip with Greenpeace, will fund the retrieval of the moorings, while a grant from NSF will pay to set out new moorings for the next two years—but only in Sermilik Fjord. Straneo doesn’t know yet how she’ll recover the moorings she left in Kangerdlugssuaq Fjord; there are no nearby villages from which to hire a boat. This work was supported by the Ocean and Climate Change Institute at WHOI, the National Science Foundation, and the National Aeronautics and Space Administration.